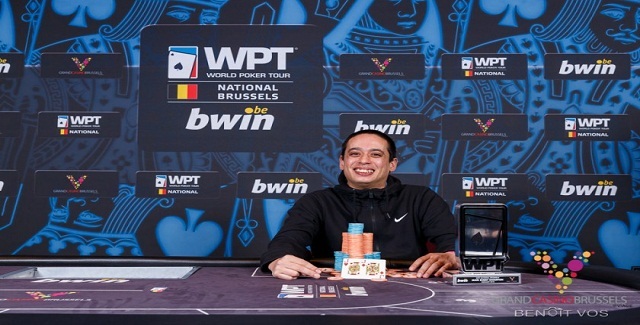 A French Pro poker player Sebastien Ta has won the season XIV of World poker tour National Brussels. Ta collected the championship title as well as the first prize of an amount €100,000. He defeated Maria Lampropoulou, and she took home €68,200 being a runner up.Lampropoulou was playing very well till the end of the game in final table but It was Ta, who steal the show by winning the first prize and the title. The €1,200 buy in WPT national Brussels main Event Day 1 Started on February 25 and attracted 457 players throughout Europe. The players generated €487,619 of total prize pool, and out of 457 players top 54 players were paid out with at least an amount €2,250. The winner was Sebastien Ta from France collected €100,000 as first prize. Maria Lampropoulou, was the runner up and took down €68,200 as prize. Tobias Peter was the third prize winner €43,300. Samuel Meunier with €32,100 was at fourth place, Jeffrey Wouter with €24,520 was at fifth place and Walter Buss completed for sixth position and an amount takes home €20,200. Meanwhile Vincent Verdikt (seventh €16,380), Mark Roovers (8th, €12,529) and Brian Benhamou completed for ninth, (€9,800) position. The High Roller of the tournament attracted 115 players to which Antonius Krijn of Nederland’s becomes the winner and earned €50,000. The Season XIV of WPT L.A Poker Classic is underway. Day 2 of the tournament attracted 515 players out of which 27 were re entrants. Entrants generated a hugh prize pool of almost $5 million. Top 63 players will earn a minimum of $18,240 as amount. Ryan Riess (299,800), David Paredes (111,600), Andy Frankenberger (87,200), Mike Gorodinsky (194,500), John Hennigan (251,100) and Joe McKeehen (218,500).